Denver City Council – Weekly Legislative meeting – Aug 19th, 2013. In light of the recent effort to rename the park, and my desire to add to the record of our neighborhood history, this video may begin to offer greater understanding and perspective to our story. As reader’s know, I have been focused primarily on the earliest chapters, and have not much addressed the years that represent La Alma and the significance of the Chicano movement and culture here. Perhaps, I feel that it is not my story to tell yet, until I reach a better understanding of events. Meanwhile, this video shows the testimony of several members of our community, past and present, and offers a background for future posts. Not all of my readers will be able to commit to the whole 40 minute clip, but neighbors should take the time if seeking insights to our community. 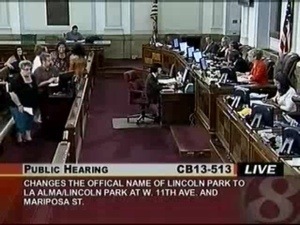 A point of confusion that I would like to clarify- The official name of the neighborhood has been La Alma/Lincoln Park since the 1980’s when a map of Denver’s neighborhoods was adopted, in an effort for communities to have a greater say in their own planning, The park was always officially called Lincoln Park until Council’s recent legislative action taken, renaming it La Alma-Lincoln Park.